A design first for Visa Lighting, our Jasper architectural troffers carry Vital Vio disinfection technology into universal spaces and provide design cohesion throughout each project with matching non-disinfecting source options. Two recessed Jasper architectural troffers are available for 2x2 and 2x4 ceiling spaces. 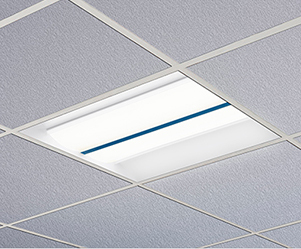 They mount to standard 15/16", 9/16" or screw-slot grid ceiling systems with 3-5" nominal depth depending on source options. Source options include 3000, 3500, 4000, and 5000K temperatures in low and high levels, as well as continuous disinfecting sources and 2-channel Tunable sources. Vital Vio's continuous disinfection technology emits a germicidal frequency to protect indoor surfaces from harmful bacteria. Because this technology produces safe light that is truly white, it can be used continually throughout the day without halting busy environments. Eco Mode, a violet light with boosted germ-fighting power, is still completely safe for people but ideal for intervals when illumination is not needed. Since the Jasper family of architectural troffers is designed to fit several source options including VioSafe™ disinfecting technology, they can be installed throughout a facility for design cohesion, with only specific areas targeted for disinfection. Come see Jasper at #LFI2018!